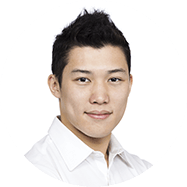 The following is a guest post from Yamini Chinnuswamy of ResumeWriter.SG, Singapore’s leading resume writing firm. Perhaps you’ve spent hours or even days polishing up your résumé, but the truth is, recruiters and hiring managers aren’t going to dedicate more than a few minutes to reading it. So you have to get the most out of your resume in those precious few minutes – both in terms of its visual appeal, and its content. We’ll talk about design and looks another time, but here are four simple ways to add some punch to the words in your resume. Which of these résumés above look better? Obviously, it’s the one on the bottom. But why? Let’s break it down, step by step. As with novels, the opening line of a résumé is the most important. Make sure any recruiter or HR manager reading your resume knows, based on that one line, exactly who you are and what you do, and why they should keep reading. This applies to both your executive summary, and the individual work scopes for each employment. The second example above lists everything pertinent in one succinct line: what you do (your responsibilities) and where you do it (the industry/company). Details such as “team of 20” and “budget of 500’000 SGD” draw a clearer picture of the scale of your work, and provide readers with the confidence to continue reading your CV. Talk about yourself all you want in your cover letter, but if you want your résumé to sound crisp and professional, avoid the “I”s. Which sounds more authoritative, concise, and factual? Using pronouns is also repetitive and unnecessary — after all, it’s your name on the top of the résumé, so it’s understood that you also have done the things described within it. In the first example, neither “a” nor “the” add any meaning to the sentence. Instead, they make it longer and more crowded. Remember: clarity is the name of the résumé game. These are résumé power words, and it’s not just because they are vivid, positive descriptors! They’re also highly specific, and cast the spotlight on your achievements. Designed, developed and executed Project ABC. The second example conveys more strength, and better articulates exactly what was done. Here is a great list of other words you can use to better highlight your accomplishments. Still need help sprucing up your accomplishments? Check out our article, How To Write Great Accomplishments For Your Resume, for more tips along those lines. Just as there are words and phrases that will invigorate your resume, there are others that can be as damaging as swear words or vulgarities in turning off any HR professional skimming through it. Recruiters and hiring managers go through hundreds of CVs every day, so it’s in your best interest to make yours an easy read. 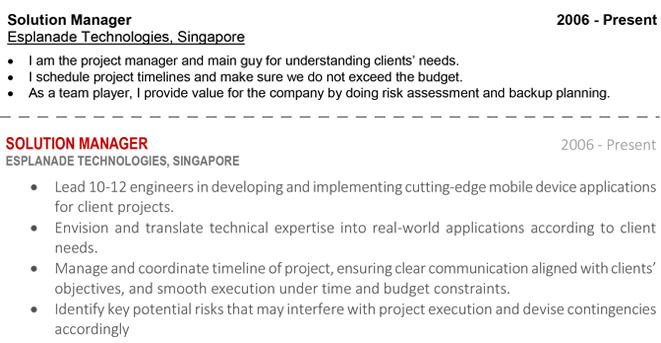 Our Career Guide in Singapore can get your resume the attention it deserves. The above examples provide simple ways to ensure your CV is punchy and lively, and might just make the difference between a recruiter who is bored by your document, or one who is intrigued enough to give you that call back. If you’d like more help in creating a crisp, clear résumé, feel free to drop us a note, and one of our consultants will be more than happy to help you out.